The floor of a kitchen needed to be replaced as it comprised of worn tiles laid directly onto a soil base, as the floor was in a traditional building it was decided that Limecrete should be used to maintain the breathability. 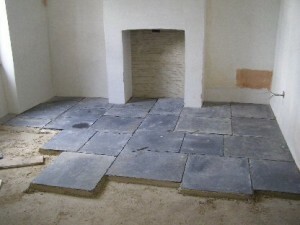 Due to the condition of the kitchen floor it was decided to remove the existing tiles and then replace the floor with a limecrete slab finished with flagstones. The existing tiles were bedded directly onto the soil base so there needed to be some excavation before the slab & the insulating clay loosefill could be laid, in this case “some” meant 10 tonnes of soil dug out by hand! As this is a traditional building with shallow foundations there was a concern about undermining them, in Picture 2 & 3 you can see that the soil has been dug out leaving a 45 degree angle. The 45 degree angle was taken from 6 inches above the foundations so as not to disturb them at all. 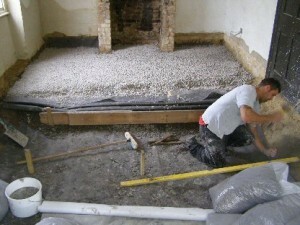 The first stage for a Limecrete floor is to level and compact the base and place a suitable geotextile membrane. 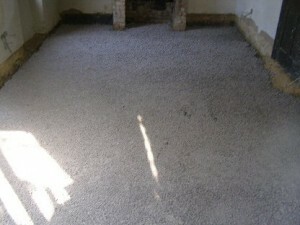 The loosefill insulation layer can then be laid, this comprises of 10-20mm coated clay aggregate, the size and coating helps to prevent capillary action, or a recycled foam glass insulation, in this case 200mm of clay aggregate was used. 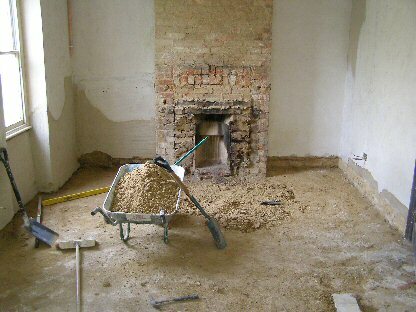 Please note that when the clay aggregate is in place it needs to be lightly tamped, this will prevent it sinking when the slab is laid onto it. A foam glass base requires the action of a wacker plate to compact it. Once laid the Leca loosefill is sandwiched between two layers of geotextile membrane, this is put below to separate the loosefill from the soil and above to stop the slab sinking into it. Geotextile membrane is used rather than Damp Proof Membrane (DPM) to keep the breathability in the floor, if a DPM was laid then any moisture would be trapped and be forced into the walls. 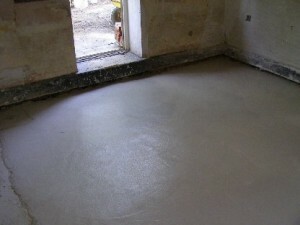 Normally the slab is laid once the loosefill is down, but this particular one was laid loose lay, membrane and limecrete slab all together and then worked back across the room. 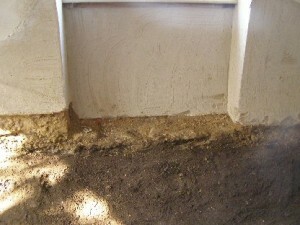 In Picture 4 you can see the build up of layers, including the two layers of geotextile membrane. For the kitchen floor the slab was 100mm thick, it was made up of 3 parts 0-20mm uncoated Leca : 1 Natural Hydraulic Lime 5 (NHL5). Using Leca as the aggregate in the slab makes it more lightweight and also gives it insulative properties. When laying the slab the mixture needs to be quite dry with just enough water to allow the mortar to hold together when squeezed. When the slab is put down it needs to be gently tamped, it looses approx 10% of its volume when it is compacted. Picture 5 shows the completed slab, as you can see it is quite rough because of the Leca, it is essential to lay a screed to protect the slab or use a minimum of 25mm bedding mortar onto it. 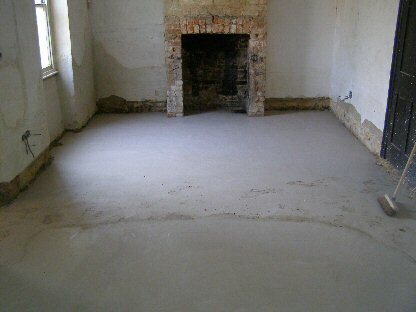 The screed / bedding mortar is usually made up of NHL5 and sharp sand at a 2:1 ratio, for the job below they used a 75mm screed laid in two parts (see Picture 6 & 7) and then laid flagstones onto it using a 25mm bed (Picture 8). 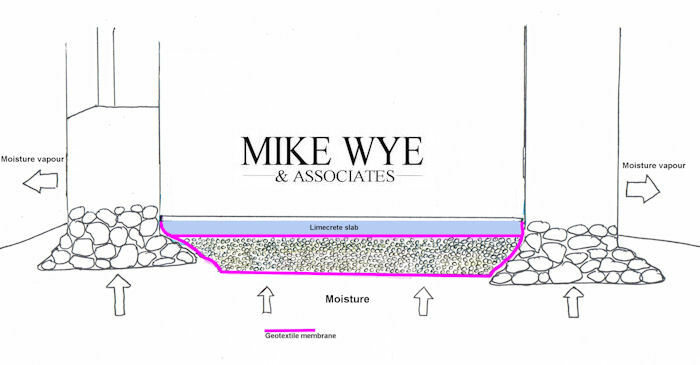 The image on the shows how this limecrete floor looks in cross section. 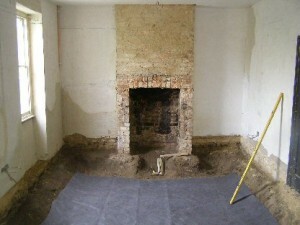 This image along method statement can be used as a guide for you or your builder to design and create your own floor. 1. The first job was to dig down to the required depth for the Loosefill insulation and the limecrete slab.